This is the real me... I typically don't wear make-up, husband honestly doesn't like it, and I just let my hair down. I'm a pretty laid back kinda person. Ok.. some history... I use to be a stamper, HUGE stamper. Was a Stampin' Up demo for a while, before they even had "hobbyists"... but that was really why I did it. But I just loved it. Husband, Rich, said I wasn't spending alot of time with him.... I was always stamping with friends or in my stamp room, which was amazing! So I gave it all up. I know.. I know... I could kick myself right in the arse... But, that is hindsight. All of my friends were stampers and since I really wasn't stamping anymore, I guess I just shyed away from everyone. 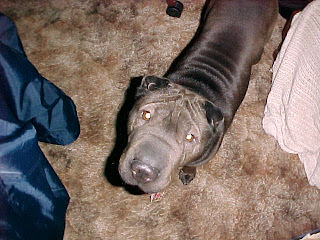 We had two terrific chinese shar-pei's; Squeakie (fawn colored) & Mindy(black one). These two were our children. We have done everything in the world for these two gals... Squeakie never had any problems, but Mindy... she was our little medical-problem dog. But my husband and I are firm believers that if you adopt a pet, regardless, that pet is your responsibility no matter what. I lives, breathes, bleeds and feels. They are like furry, four-legged children. And... they completely depend on you to take care of them. Well... Mindy's problems started when she was 2 years old. She developed Addison's disease. http://www.addisondogs.com/ We started out with pills... lots of pills and lots of blood work to try and get her balanced. Whew.... that took alot of years (and money), but we would do anything for them. Then it got to the point where the pills weren't doing it, then it became shots every 25 days and prednisone every day. Poor Mindy. Isn't she the cutest? We enveloped our lives around our pets. Couldn't go out after work with the group... someone always had to schedule being home to let them out and take care of them. Medicine twice a day like clockwork and boy, when she got sick... time off from work. We were the best pet owners in the world. We even felt so guilty about taking vacations that we bought a place down in Berlin, MD, (Near Ocean City) so we can take them with us on the weekend for mini-vacations. Then one cold, Friday night in January, Rich took Mindy to the doctors for her physical. We weren't getting along and I went to the ocean alone. He called me that Friday night and said that they were sending to a pet opthamologist in Annapolis, Mindy's eyesight was being lost. 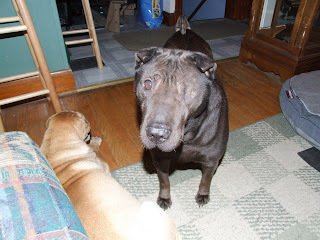 Her eye had turned white and with Shar-pei, if not treated within 24 hours, she would lose her eyesite. We did everything we could, laser eye treatments, drops, you name it... but the glaucoma was so bad in one eye that it was crushing her optic nerve and she was in pain. The doctor (Dr. Anne Weigt who is absolutely fabulous! ), said there is nothing they can do but to take the eye. She was already blind in it and was in pain. So we did the only thing we could do, have her eye removed and do everything we could to save the other eye. She was 7 years old when this happened. So now, between the Addison's disease and the glaucoma, she was on about 11 different medications & eye drops a day. Yeah... again... our life revolved around our pups. But that was ok. They brought us great job. Squeakie was such a trooper through all of this. A couple of years later, Mindy and Squeakie started fighting. Squeakie was slow and sluggsih. But hey... she was 16 years old... Mindy disposition was changing and it was because she was in pain with her eye. Nothing else to due, June 2008, we had to have the other eye removed. Again, the doctor said she was in so much pain and couldn't see anyway, it was best. She actually said, after the surgery, that the optic nerve was so damaged, that she stopped and took pictures, for a journal. I couldn't imagine the pain she was going through... so we took a week off of work to be with her after the surgery. When you first look at her, you really can't tell she doesn't have any eyes. She got around great, as long as we didn't move the furniture. She became quite passive, no more running around. She learned that twice. She took off running thinking she was still a pup and ran straight into the fence. The second time was head first into our parked trailer.. yeah... that one hurt. But after that, she was terrific. No problems. But Squeakie was still sluggish and becoming out of breath. We eventually started calling her "log dog" because it was almost like dragging a log outside.... but we were quite patient with her... we would never 'drag' her. These were our children. But... August 2008, an incident happened. Mindy & Squeakie got into a fight... something they hadn't done in 8 years. It wasn't 'horrible' but for me it was bad enough. Squeakie's disposition changed drastically so we made the decision to put her down. On that day, we couldn't do it. Rich and I cried the whole day, and the doctor said bring her in... she has an appointment, let's check her out. That was such a relief. So we did... and she was having complications from congestive heart failure... there was nothing they could do. She was 16-1/2 years old. This is the face of an old pup.... God Bless you Squeakie! Having Mindy comforted us... even though we cried like babies for days, Mindy was there. Then that November, she developed pnuemonia. A week in doggy ICU... but she was on the mend. She still had a slight cough since then and we even had her on antibiotics for 30 days... but that slight cough always remained. We both figured our time was limited since she had been through so much already... and figured ok... hopefully we'll get another 2 good years out of her. January she got sick again... more medication. March 2009, I went to visit my family in WV for the weekend. Mom just found out she has a 'mass' on her thyroid and was going to have a biopsy that Monday. Dad needed the calvary (me) to come up and spend some quality time with her to get her mind off of 'things'. I came home and Mindy was laying on her pillow. She wouldn't get up... she just laid there wagging her tail. Rich said she wasn't feeling well and she just started acting like that an hour before I got home. She hadn't eaten her food either. So I took her into the bathroom and ran the shower for a steam bath to help her breath. She couldn't walk out of the bathroom... just two steps... stop... two more steps, lay down. So Rich gathered her up (all 70 pounds of her) and off to the emergency room we went. Of course, everyone at Falls Rd. Animal Hospital (which is Marylands only 24-hour emergency/shock-trauma facility for pets) knew us very well... After 3 hours, the doctor said her pneumonia was horrible. They showed us the x-rays from her trip in August to current and it was really horrible. (yes... still crying like a baby about this). Also her insulin was off and her white blood cell count was through the roof, but she had no fever. They put her into doggy ICU and in an oxygen tent. Of course we called every day, Tuesday I called... the doctor said they had to give her insulin (I knew this was trouble) and she still hadn't eaten. Rich suggested that we go and see her that evening. I already had planned on going over a friend's house, Pam Parto - Stampin' Up! demonstrator(http://www.stampinup.net/esuite/home/pamparto/), for a first time, back into stamping class. I knew Rich was right, so we took her food up and they brought her out. We stayed in a surgery room with her... I wrapped her in my jacket and just loved on her. We both did. She wouldn't eat for us. We couldn't even force her to eat... she had those jaws clenched. I asked the doctor if they could put a feeding tube down her nose so she could get nutrition and he said they only do that at the university and it was $1500 a day... I would have gotten a 2nd job to do what I could for her. The doctor said to give her a couple more days. Of course I was (and am now) crying because I didn't want to make the decision to put her down. So... we walked her back to her little doggy ICU crate and put her in. I took my scarf and put it in the crate with her and she snuggled her head down on it. 4:35am the next morning, the hospital called to say Mindy had died through the night. They had tried to receitate her, but it was too late. 3/3/09. So... of course the days to follow were horrible. Rich and I had not been without some kind of puppy distraction for 16-1/2 years of our 17 years of marriage. I gathered all of the doggy pillows and toys and food up and took them to a Chinese Shar-pei rescue in Maryland. http://www.macspro.org/ They have so many pups that need good homes, but I just couldn't. Nothing, I mean nothing, could replace the two most perfect dogs we had. So... I came home to an empty house... no dogs waiting to go out to pee.... no medicine to give... no letting them out and manuevering around them... quiet... empty. Rich said, let's go out on a date. Huh? Date? Great idea!!! Then the next day I got a Stampin' Up! Brochure from my friend April Prachniak, also a Stampin' Up demonstrator. http://www.stampinup.net/esuite/home/mystampplace/. So I went onto her website and signed up for a class... just to keep busy. Then I remembered Blaney Spinelli, who was my up-line, http://www.stampinup.net/esuite/home/blaney/ and http://www.stamplandstudio.com/. So I signed up for her Forget-me-not class. And of course another one of Pam's classes since I had missed one. When I got to Pam's house... a couple of people that I use to stamp with were there, Donna & Lynn. Gosh... it was so terrific seeing them again... it had been years! All of a sudden, I realized what I had been missing... not having a hobby, taking care of Rich and the dogs were my hobby. But now, this was 'me time'... girl time... creative time... quiet time... whatever it was, it was just keeping busy. Now... that's what I do... just keep busy. If I don't, I cry about Mindy and Squeakie. I know... I know ... I'm a sap... I love my dogs deeply. They were my children and forever will be. Stamping I had fun with. I shared with everyone, friends and family. Now... I'm just keeping busy. My heart breaks for you and your loss. I have a Chihuahua named Princess Diana. She is the first dog I've ever owned.I'd been a cat lover my whole life but I wanted a pet that could travel with us in our RV. Princess will be 4 in October and she is my terrific travel companion. We love her just like she is one of our children. I never knew you could have this much love for a tiny little dog. I was reading your entry and have just sat her crying. I wish you happy feelings and fun memories of your babies. I pray that the pain gets better with time. I do recommend getting another puppy soon so all that love can go to another precious dog.